That first “polar vortex” caught us napping, dreaming our playful global warming scenarios, the ones in which we don’t run out of fresh water but we do get to have a beach ten minutes from downtown D.C.. You know, the kinder gentler apocalypse where somehow we pull a last minute yoo-ee and don’t wreck the planet. But this latest “parade of clippers” paired with a brisk course of Arctic palette cleansers gave us all a chance to embrace our inner Yetis. People in other parts of the nation, not including those rarified climates of California, Florida or Seattle, regularly have to put up with the sort of winter smackdown that we’ve been enjoying for the past month, so I don’t expect the residents of, say, Michigan, have much sympathy with whining. There will be no whining here. 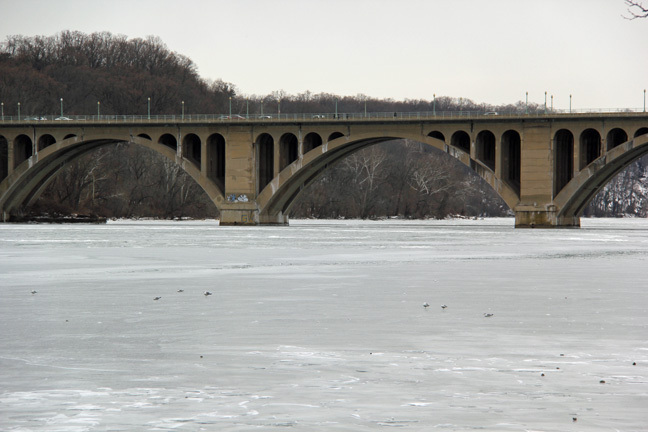 Instead, I strapped on my camera and set forth to capture the wonderfulness of the frigid landscape. Unfortunately, I’m not the intrepid shutterbug I once was, and failed to come up with anything remotely dramatic. 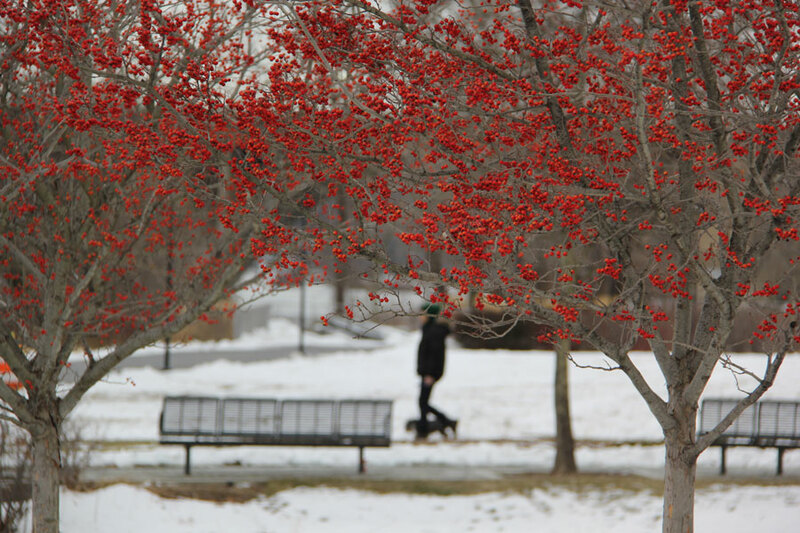 Bright berries light up the snowy Georgetown Waterfront Park. However, luckily, here in D.C. there is no shortage of crazy weather nuts who make the effort and share with us all the most breathtaking sunrise and sunset and storm photos. Several of these guys also write for the Washington Post’s Weather Gang column, and they post their stunning pix there. Check these out! I may never learn to love the cold, but I’m a sucker for beautiful sunrises and sunsets. And this bone chilling weather seems to lend an extra dimension of dazzle to the scenery. We don’t have a lot of orchards here in the city, of course. But the principle is solid. Each year the people who bank on the Cherry Blossom Festival endure months of anxiety over whether or not a late frost or a turbo-charged spring will sabotage the blooms. So maybe we’d best keep those earmuffs handy. And people who don’t like it can just chill. Best sunrise and sunset are November thru early March. I work outside everyday,all day,year-round,and have been a keen observer of these events.